Autorun Eater is a very useful freeware to prevent any malicious infections, such as virus, trojan, spyware, adware etc to be transported from USB flash drive to hard disk. I give my thumb up to the advantage of no future update or upgrade is necessary (not like firewall, anti virus, anti spyware, anti adware etc), because it immediately gives an alert on the screen whenever there is autorun.inf detected in the USB flash drive, or any other removable storage, media cards etc. This detection is performed even before an user accesses these drives (c: to z:). The removal of autorun.inf is either automatic or upon user’s confirmation, user is able to change this setting any time from tray menu option. The start up screen is very amusing that a goat in the farm is shown, with a goat’s “bleat” sound. Even it is shown as oldmcdonald.exe when this program is staying resident in system memory, as seen in Windows Task Manager. Try Visit the Farm! 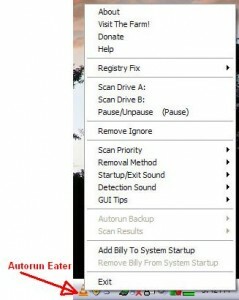 and there are some additional useful information about Autorun Eater freeware. Help is available by accessing the icon from tray menu options. Not to worry, as the installation is very direct and easy, no tweak, special configuration or technical knowledge is required. The new version 2.4 now comes with an option of ‘Close Autoplay’ to prevent execution of malware via AutoPlay window. 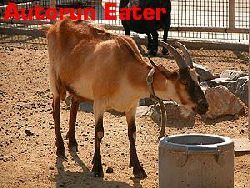 Download and install Autorun Eater Freeware now.